I have recently completed the rather exquisite Alice: Madness Returns (take note of the semicolon) and to get this out of the way I'm partly annoyed and partly glad it's over. Though I shouldn't get ahead of myself, this is the second incantation of the the original Alice, both created by American Mcgee, being a fan of the original I had heard that a film adaptation of the game was in the works, which got me quite excited ( for a few years at least as this was announced in 2000) and I'm not going to mention the new Alice in Wonderland film by the venerable Tim Burton which is an entirely different story. 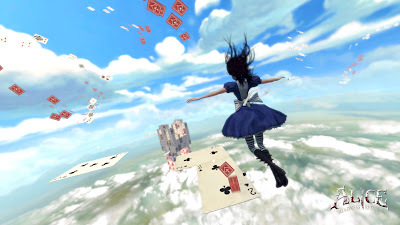 Then one day I heard good ol' 'American' had a new game studio and had made a sequel to his original Alice, this made me quite pertubed as I was under the impression that the the original American Mcgee's Alice did not need a sequel as it was meant to be a dark, twisted and abnormal version of the disney film and thats what it was. 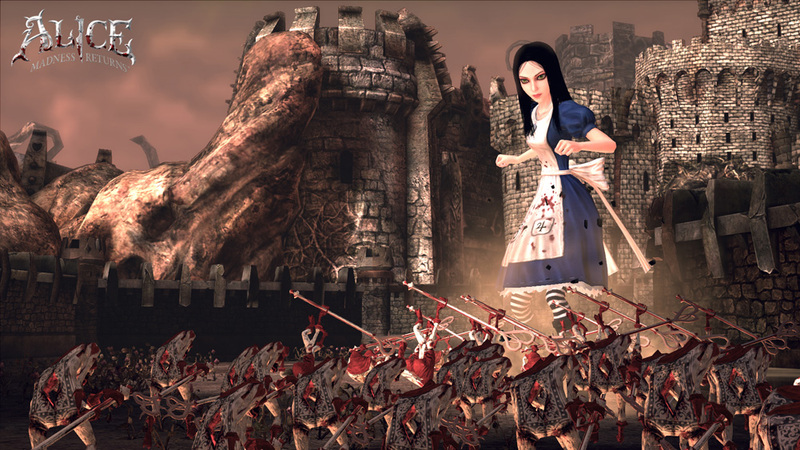 Having played it through though the ending was acceptable (and predictable enough) but the story of Alice Madness returns does answer a lot if questions certain skeptical types may have, and to be honest the story was one of the only things that kept me going. The storyline in Alice Madness returns is very intruiging, it explains what happened after Alice had supposedly rid herself of her inner demons and her path to full realization of the events that led to her families death, this is helped by the 'memories' you find hidden along the way which unlock quotes from various people in Alice's life. 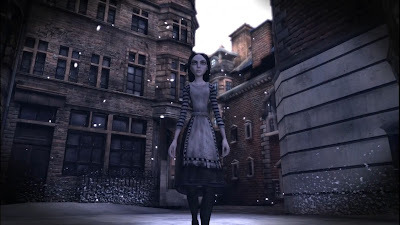 I must say that it was actually the scenes in the victorian-era England where Alice now lives that were my favorite to play as it shows what Alice's life is like now, something which you never got to play through in the last game. These short levels show what happens to Alice between the environments in wonderland that Alice goes in and out of and while they don't exactly explain why Alice is in a particular section of Wonderland they still are a welcome addition to the game. The first level in the game, 'The Vale of Tears', one thing that is obvious as soon as you start is how good the game looks. 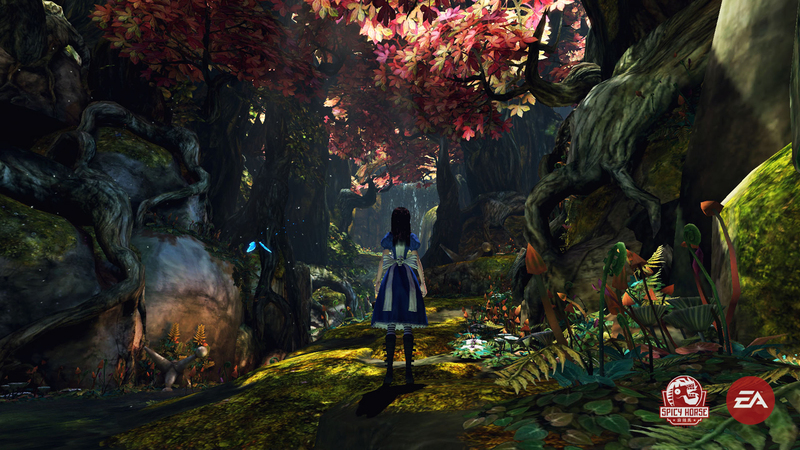 Once starting the game and falling into wonderland for the first time it was easy to see that the game had been quite graphically updated with stunning detail for eatch environment that you travel through over the course of the game. These 'environments' change at certain points within the game and I have to say my favorite was the 'Oriental Grove' world which had a great eastern theme to it as well as 'Cardbridge', and the screenshot below speaks for itself, there's still the usual scary places like Queensland and the freaky Dollhouse but I found as in the last game the not-as-scary were the most beautiful to look at. I also found (after finishing the game) that the costume changes Alice goes through when changing worlds actually changes gameplay elements (i.e. the original costume allows to regain health while using the shrink ability) and you could also change the styles of the weapons, which would have been great to know beforehand but anyway. Cardbridge... something that would a nightmare in the last game but one of my favorite sections in this one. With the last game the the platform element was quite tricky and because there was quite a large amount of it I ended up getting frustrated and ended up using a flying cheat just so i could finish the game and see what happened, this has been fixed to a major degree by introducing a triple jump and also a floating ability which makes probably the largest aspect of the game quite manageable. 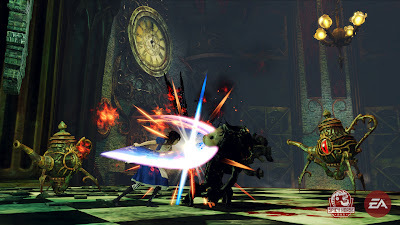 In the first Alice weapons were ofen crude and slow and fighting got quite annoying and the changes to this were very welcome, the action is now very smooth and looks spectacular the way the game slows to a crawl for a split second when an enemy strikes almost telling you to use the dodge ability, or when you finish off an enemy and are rewarded with a slow motion blood splatter, the range of weaponry is very satisfying to use with every noise you know that you have oir haven't hit your target, the only thing I can think of is that I now cannot throw the Vorpal blade at my enemies which was my favorite move of the last game, but nevertheless slicing and smashing through enemies quickly has never been more fun. Unfortunately while playing through the game and enjoying the beautiful scenery and the edgy fast paced combat things inevitably started to get repetitive and I found that some chapters lasted forever and I just wanted to see what happens. This happened in the last Alice and I was well aware that it was going to happen again, I felt that some worlds were just too long but I guess having played the last game once I met all of the old characters again and saw the scenery and the new enemies I had little pateince for the rest of the world and just wanted to end it soon, as I said before It was the story that kept me going most of the time the parts where Alice gets pulled back to reality helped quite a bit but at the back of my mind I just wanted to know what happens to Alice in the end primarily because I do have a a lot of sympathy for her having been through two games of a playable version of a young girls mental torture. But unfortunately Alice madness returns has one of the most unsatisfying endings I've ever come across, so I left it half glad that I had finished it and half annoyed at my un-fullfillness. In conclusion I would say that for fans of the original it's a great experience to see an old game re-created with new graphics and better gameplay elements and for newcomers it's a good delve into the twisted mind of American Mcgee's Alice and with the original Alice game included with this one free of charge it's well worth the purchase. As for coming back and playing it again I am afraid to say this game does have quite a big lastability issue, I would have gladly settled for a feature length movie of the last game but something tells me I may be able to have my cake and eat it too. Well thats all for now, I leave you with the fabulous launch trailer.